Most of the votives that we have featured so far on this blog are objects in the conventional sense – three-dimensional ‘things’ that can be held, carried into a sanctuary, and get moved around once they are in there. And it’s probably true that most people – if asked to ‘think of a votive offering’ – would automatically come up with some kind of portable object, whether this be a painted wooden plaque, a stone, a model of a body part or of a swaddled baby. However, one site that I visited on a trip to Sardinia last month reminded me that votive offerings don’t necessarily have to be things, as such. This was the hypogeum underneath the seventeenth-century church of San Salvatore in the town of Cabras on the Western coast of the island, near to the ruins of the Phoenician city of Tharros. It’s a truly breathtaking site – a six-chambered structure cut into the rock, walls covered with images and texts drawn on with charcoal and natural dyes. The chronology of these sketches is not entirely clear, but the oldest are thought to date from the fourth century, while many were added in the 16th and 17th centuries. The ‘star pieces’ include some late-antique sketches of Mars and Venus engaged in conversation, Hercules fighting the Nemean Lion, a Greek alphabet carefully arranged in four columns, a long Arabic inscription stating the author’s allegiance to the Islamic faith, and many figurative images of people, animals, and ships. 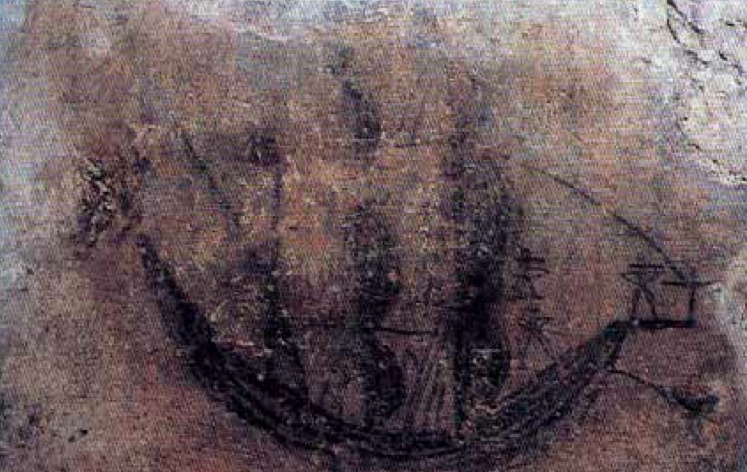 This last group – the ships – caught my attention on account of their similarity to the votive models and paintings of ships that are common offerings in other sanctuaries in Sardinia, as well as more widely around the Mediterranean world. I’d seen some wonderful examples of nautical votives the previous week in the Sanctuary of the Madonna di Bonaria in Cagliari, where eighteenth- and nineteenth-century sailors had dedicated them after shipwrecks or before potentially dangerous voyages. At San Salvatore, instead, it seems that sailors (or their worried/grateful families?) etched their votives directly onto the sanctuary wall, creating a direct and permanent link to the protective deity. Other graffiti at San Salvatore also have a strong votive flavour, such as the monogram RVF, which appears at least 8 times in different parts of the hypogeum, written by different hands and presumably at different times. Scholars see these letters as shorthand for a Phoenician phrase meaning ‘cure, save, give health’: they might thus be seen as a type of healing votive, similar in some ways to the more familiar anatomical votives representing parts of the human body. Another image depicts a person in a cage (see top image), which some people have taken to indicate that the hypogeum was once used as a prison. But perhaps we should also allow for the possibility that this, too, was an ex-voto? Again, across the island in the sanctuary of Bonaria we find votive offerings related to slavery and liberation, including enormous ostrich eggs and heavy iron chains. We don’t know whether more conventional types of votive object were also dedicated at San Salvatore – if so, they have since been lost or removed, which is unsurprising given the site’s long history of use. However, it isn’t hard to understand why some people opted for graffiti to express their wishes and thanks to the gods. In addition to the obvious point about permanence, writing on walls is cheap or even free, allows for personalisation, and means that the author can communicate directly with the deity, without the need for the intervention of another craftsman. It also gives its author control over where in the sanctuary the offering is placed, and how it appears in relation to other images. Finally, I can’t help thinking that actual process of making these graffiti must have heightened the tension and intimacy of the dedicatory act, since it required greater physical input and mental concentration than the simple deposition of a prefabricated votive offering. Do you know of any other examples of ‘sacred graffiti’, from any period of history? If so, we’d be delighted to hear about them (you can add them to the comments section below).